If you aren’t a fan of whole brussels sprouts, try them shredded! These quick-sauteed shredded brussels sprouts tossed with crisp bacon, toasted walnuts, apple cider vinegar, and a touch of brown sugar are a delicious, healthy, and satisfying fall side dish. It’s time for Fall Fest again and this week we’re celebrating brassicas – a genus of plants that includes cabbage, cauliflower, brussels sprouts, and more. I chose to focus on brussels sprouts because they are currently available on the stalk and I think it’s fun to take home a giant, awkward stalk of brussels sprouts! Up until a few years ago, I had never even seen brussels sprouts on the stalk. I really hadn’t thought too much about how they grew – I guess I assumed they grew out of the ground like tiny little heads of cabbage. Thinking about it now, that seems a little silly, but you have to admit that the way they grow on this crazy stalk is a little silly looking, too! I’m a sucker for strange looking produce, and as long as they seem fresh, I can never resist buying a hefty club of brussels sprouts when I see them at Trader Joe’s, Whole Foods, the local supermarket, or a Farmer’s Market – yep, they’re sold pretty much everywhere around here during the fall. Harvesting the sprouts from the stalk is much simpler than you might think. Don’t make the mistake I did the first time I was presented with the challenge. 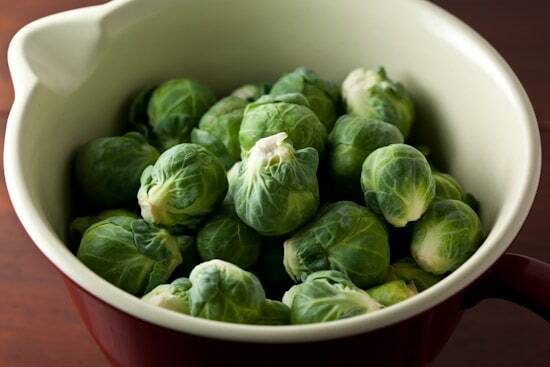 The sprouts don’t need to be cut off with a knife – it’s much easier (and safer) to snap them off with your fingers. It takes no time at all and you’ll end up with a big bowl of beautiful, fresh brussels sprouts – my stalk yielded close to two pounds. The sprouts will probably range in size from teeny tiny to very large, so if you’re cooking them whole, you might want to sort them according to size and start cooking the larger ones first. If you’re going to shred them like I did, size doesn’t matter. 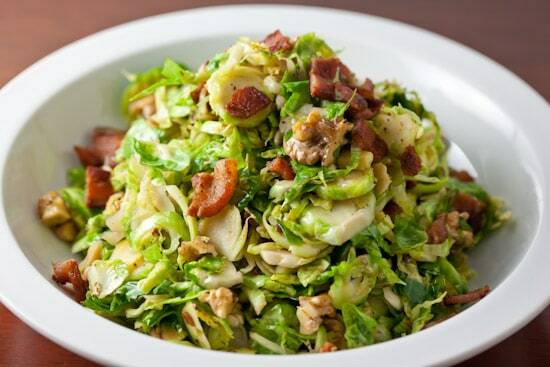 I had this great plan for my brussels sprouts – I wanted to cook them with shredded apple and onion in a bit of bacon fat then toss in some cider vinegar, chopped walnuts, and blue cheese. I had been dreaming about it all day. But when the time came to actually make the dish, I realized I was out of both apples and blue cheese! Oh well, at least I had some good bacon and a bag full of fresh walnuts from my uncle’s ranch. 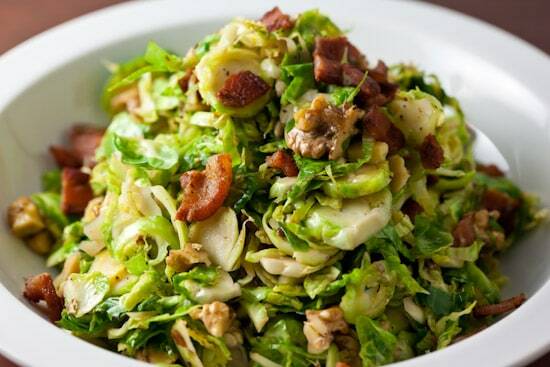 I simplified the recipe to shredded brussels sprouts with bacon and walnuts and continued. I rinsed the sprouts, trimmed the bottoms, and removed any ugly outer leaves (there weren’t many – these were a gorgeous bunch of brussels sprouts). I briefly thought about slicing them by hand but laziness took over and I decided to send them through the slicing blade of my food processor instead. The Cuisinart accomplished the task in about a minute. Since the walnuts were still in the shell, I got out the hammer and cracked enough to equal about half a cup (plus enough to snack on while cooking). If you’ve never had good, fresh walnuts, you really need to find some. The flavor is amazing – rich and sweet with absolutely no bitterness. 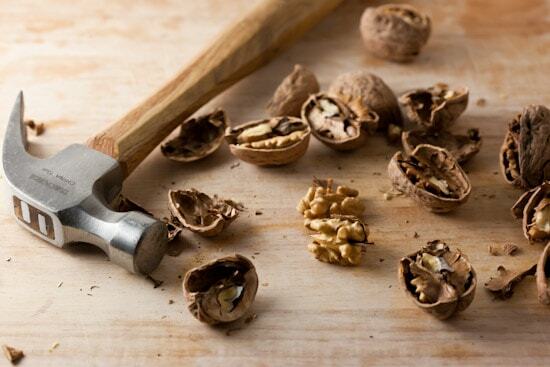 If you don’t have a nutcracker, no problem, it’s simple to open them with a hammer. Just hold the nut on a hard surface with the pointed tip facing up and hit the top with the hammer (not too hard) until it cracks open. It will split in half or into four pieces and you can pick the walnuts out with your fingers (or a fork if they’re being stubborn). I toasted the walnuts at 350 degrees for about 8 minutes before chopping and adding to the sprouts. I also ended up adding some sugar to the cider vinegar dressing since I didn’t have apples to provide the sweetness I was looking for. I added a drizzle of walnut oil since I had some handy, but you could use a neutral-flavored oil or even a splash of apple cider to cut the vinegar in the dressing. I loved the simple combination of brussels sprouts, bacon, and walnuts and didn’t even miss the extra ingredients I had planned on using. But I’m still going to try it with apples and blue cheese next time! 1. In a small bowl, whisk together vinegar, sugar, and oil; set aside. 2. In a large skillet, cook bacon until crisp. Remove bacon, cut or crumble into pieces, and set aside. Pour off all but 2 tablespoons of drippings in pan (if there aren't enough drippings to equal 2 tbsp, add a little butter or oil). 3. Heat bacon drippings over medium-high then add shredded brussels sprouts. Cook, stirring constantly, for 3 to 5 minutes, or until just tender. Remove from heat and stir in bacon, walnuts, and dressing. Season with salt and pepper to taste. Looks great. Bacon and brussel sprouts are always a tasty combination!Here's my contribution to this week's Fall Fest: http://savorymomentsblog.blogspot.com/2010/11/red-cabbage-and-green-apple-slaw.html -- Red cabbage and green apple slaw. Wow that looks so good! i think i may be using this recipe for one of the holiday dinners. Great pics...beautiful. OMG !! that looks so good. I'm making it. Definitely. What a beautiful dish!My Fall Fest contribution was broccoli: http://professionalbakist.blogspot.com/2010/11/stuff-like-that-there.html. Really nice post. I love Brussels sprouts but haven't bought them on the stalk yet. You've inspired me to do so. And what a great mix of flavors, bacon, blue cheese and walnuts. Nice! This is a fantastic recipe! Bacon and walnuts are so good, I love all that crunch in the salad. Thanks for sharing. Happy WalnutWednesday! This will make the PERFECT addition to my Thansgiving table!! I'm bookmarking it now. Thanks! Have a great day!!! That looks like a great recipe, I love the combo of bacon and walnuts! Thanks for sharing!! I love shredded Brussels Sprouts and will definitely be giving this recipe a try. Your photos are always so inspiring and make me hungry! Love the idea of shredding the Brussell Sprouts with the food processor. That is genius. Bacon and walnuts with the walnut oil makes a lot of sense. Love walnut oil and always have it in my pantry from Whole Foods or Cost Plus World Imports. 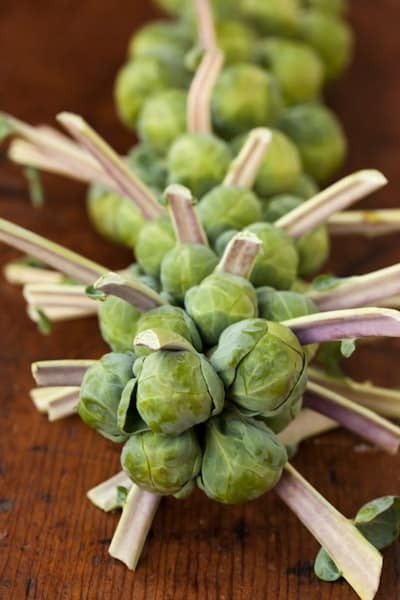 Since I'll be cooking green beans with walnut oil and toasted walnuts on Thanksgiving - I might do the apples and bleu cheese with the sprouts.Since I started shopping at TJs I've seen these big stalks of Brussel Sprouts but haven't bought them. You've inspired me today. I think they would probably be somewhat fresher on the stalk compared to buying them already cut off. I'm not a fan of brussel sprouts, but this recipe is inspiring me to give them another shot, it sound amazing. This is a great looking dish! We love some brussels - thanks for the new recipe! You had me at Brussels Sprouts. 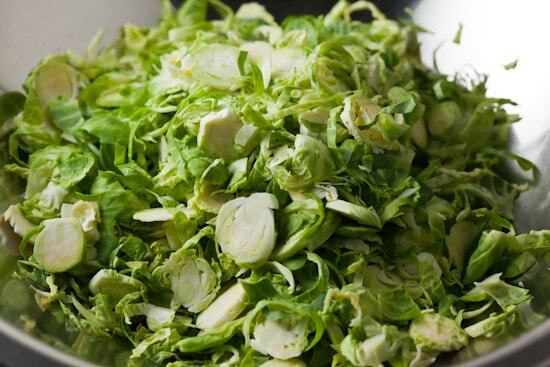 I love this brussels sprout recipe, used it for a Thanksgiving side dish and people loved it. Thanks for posting! I finally got around to trying this dish and it was delicious! Thanks for sharing! I just made the Brussels sprouts with bacon and walnuts and it was amazing. I even blogged about it I thought it was so good. I'm hoping to convert some non-believers with this one!! Thanks for a great recipe! Thanks for your marvelous posting! I actually enjoyed reading it, you can be a great author.I will make sure to bookmark your blog and will often come back in the future. I want to encourage yourself to continue your great posts, have a nice afternoon!